The newly built, 126-room AC Hotel Minneapolis West End officially opened this week in St. Louis Park. It has the same European feel as other AC Hotels that have recently opened in the Twin Cities with a kitchen with a Berkel meat slicer and perfumed musk that is sprayed throughout the hotel. But there are also some unique features that make the hotel stand out. Located on Wayzata Boulevard close to the Interstate 394 and Hwy. 100 interchange, the AC Hotel Minneapolis West End has views of the downtown Minneapolis skyline from some of the rooms as well as from its sixth-floor, rooftop bar and lounge Reveal. Reveal is heated and open to the public. As part of an AC Exclusive Social Club (ACE), members at the West End hotel will get to take advantage of special food/drink and hotel discounts such as free drink hours. The membership costs $200 a year. The hotel has several other luxurious features such as a self-serve station of lavender satchels that guests can put under their pillow (purported to help with sleep) and a wall mounted corkscrew for wine. The hotel has more than 100,000 square feet of common space (meeting spaces, fitness center etc.). Construction of the six-story hotel began in November 2016. The hotel is managed by employee-owned TPI Hospitality, which is based in Willmar, Minn. 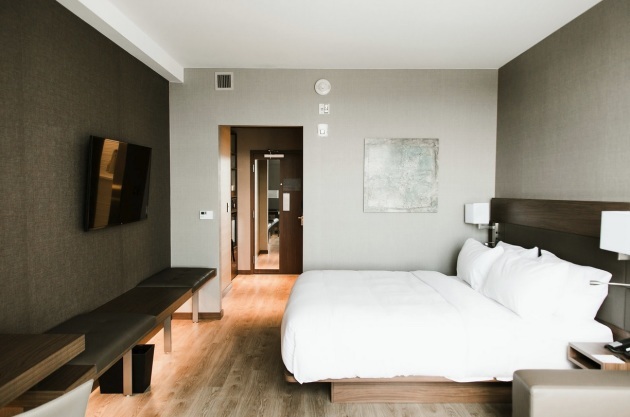 The West End opening follows several other AC Hotels being built in the area including the AC Hotel Bloomington Mall of America, which opened about a year ago, and the AC Hotel in downtown Minneapolis that opened in 2016. Some of the inaugural guests to the AC Hotel Minneapolis West End who check in Tuesday won’t be international business travelers but instead high school hockey players from Marjory Stoneman Douglas High School in Parkland, Fla., who are in town for the USA Youth Hockey National Championships. The high school was recently devastated by a mass shooting last month that left 17 people dead. TPI Hospitality, which also has a presence in Florida, offered the team a free stay at the hotel.